Said to have been recorded on January 24, the alarming video,was posted to the Facebook page of ‘Chhut Wutty’ on Friday (Jan 25) where it has quickly racked up more than 831,000 views. Several other clips uploaded showing the lead-up to the violence have also received thousands of views. Appearing to have been recorded from behind the Cambodia police firing line, the disturbing video begins with the sound of guns being fired, as the videographer runs across what appears to be freshly graded land forming part of a new real estate development. In the distance people can be seen running. Police with guns cross in front of the camera, as too does a Cambodia police officer. 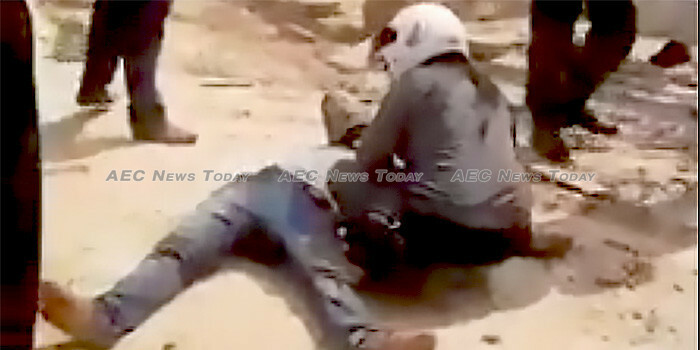 As the videographer reaches the other side of a freshly levelled road, the camera captures one woman wearing a motorcycle helmet attempting to help a man on the ground. A person of similar appearance can be seen preparing petrol bombs in the third video on this page. Sporadic shooting can be heard as soldiers gather around people seeking refuge in a culvert. Continuing to record as he walks along the road, the camera captures a police man holding what appears to be a golf club, before falling on a man lying motionless on the ground. Additional video shows what appear to be plastic bottles partially filled with petrol lying on the ground, while a Cambodia police officer is seen stomping on a man he has just cable-tied. A man kicks over a motorbike in the background. The dramatic vision, along with another clip showing villagers standing behind burning tires and throwing rocks at advancing Cambodia police, was reportedly recorded on the same day that Prime Minister Hun Sen reportedly told the Cambodian army to “destroy” opponents threatening the government. According to Radio Free Asia (RFA) six villagers were arrested and one was left critically injured with a bullet wound to the chest following the clash, which occurred when authorities attempted to forcibly evict villagers involved in a land dispute. A 10-year-old boy was also reportedly beaten by authorities resulting in ‘light injuries’. Speaking with RFA Khmer, one villager said police had beaten residents who had gathered to protest the eviction, who had erected barricades of burning tires to ward off any attempt to remove them. When the police advanced, the eye witness who wished to remain anonymous citing personal safety concerns, said the villagers had attempted to fight them off with rocks and petrol bombs. The account was collaborated by Cheap Sotheary, the Sihanoukville provincial coordinator for local rights group Adhoc, who told RFA that she she was present during the crackdown. “It was like a war zone”, she reportedly said, adding “the police fired many bullets”. Ms Cheap then went on to describe having seen villagers with “bruises all over their bodies” after being beaten by authorities. On March 8 last year Cambodia security forces fired at protestors in Kratie province, resulting in two protesters and seven security officials reportedly injured. According to the Khmer Times, villagers claim to have inhabited the land since 2002, with some having purchased the land from other villagers. The Supreme Court of Cambodia, however, had earlier ruled that the land be returned to nine families, who had claimed its return after a sale in 1993 had failed to complete due to none payment by the purchaser. Provincial authority spokesman Y Thearin told The Phnom Penh Post and the Khmer Times that police had entered the site to measure 71 hectares (about 175 acres) of land for the owner in accordance with an order of the Supreme Court. “Nobody initially opposed the [police] inspection, but some villagers interfered and burned car tyres, throwing bottles of petrol at the authorities. “I don’t know where they were from. They don’t have land in that area. I don’t know who invited them”, he reportedly said, adding that there were was “only 10 houses” on the land. The dramatic video couldn’t come at a worse time for the Cambodia government. In November the EU began the formal process to strip Cambodia of its Everything but Arms (EBA) status over concerns at lack of political freedom and human rights, which will see tariffs applied to Cambodian goods imported into the EU. In 2018 Cambodian exports to the EU topped $5.8 million, making it the country’s second largest export market. Based on last year’s export’s the removal of the EBA would have seen Cambodia imports to the EU attract some $676 million in taxes. Early in January a group of US Senators proposed the Cambodia Accountability and Return on Investment (CARI) act, which could see restrictions placed on Cambodian officials including asset freezes. According to Senator Ted Cruz, one of the sponsors of the bill, the legislation is “an appropriate response [to] Hun Sen’s protracted tyranny and unrelenting destruction of democracy in Cambodia”. Cambodia’s land records were destroyed during the Khmer Rouge regime. Those who returned after the genocide were given their old land back by the fledgling administration following the liberation of Cambodia by Vietnam, in addition to extra land — 100 metres x 50 metres (328x 124ft) — for each child, or cow they returned with. Formalisation of the titles is ongoing, with many of the original returnees having sold their land prior to formal land certificates being issued. Update: The story was last updated at 12:39 local time on January 31, 2019. Additional information relating to the land ownership and Supreme Court was added.